The Warburg Effect refers to the fact that cancer cells, somewhat counter intuitively, prefers fermentation as a source of energy rather than the more efficient mitochondrial pathway of oxidative phosphorylation (OxPhos). We discussed this in our previous post. 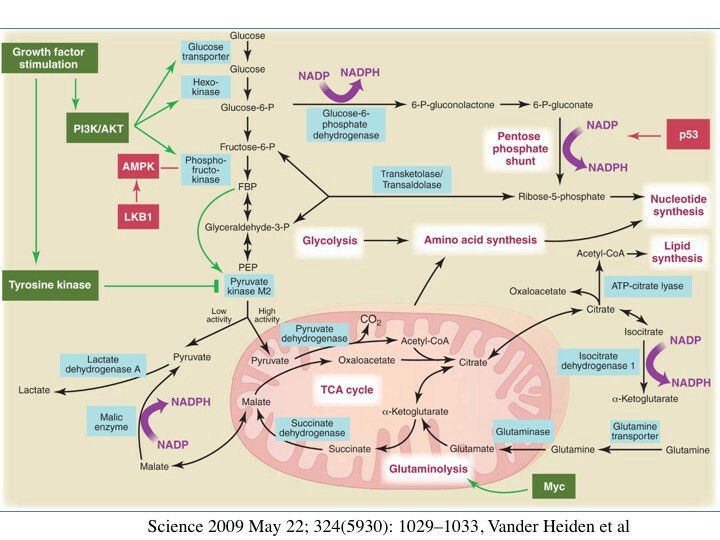 In normal tissues, cell may either use OxPhos which generates 36 ATP or anaerobic glycolysis which gives you 2 ATP. 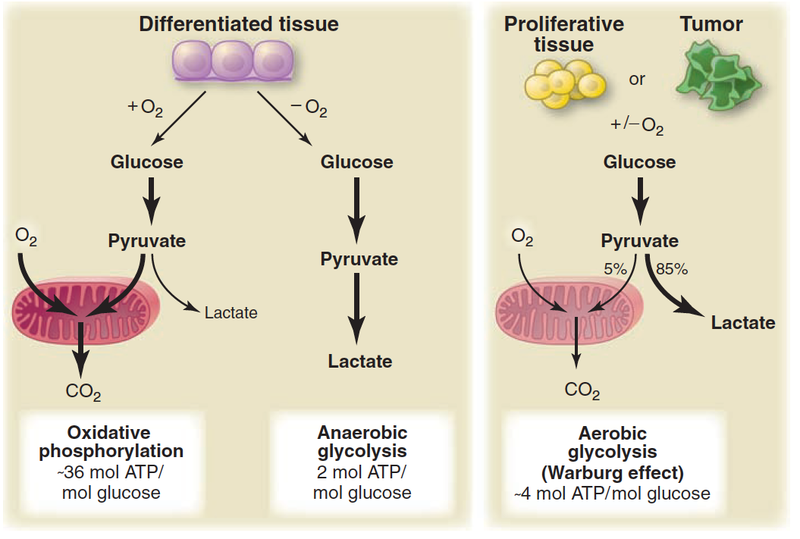 Anaerobic means ‘without oxygen’ and glycolysis means ‘burning of glucose’. For the same 1 glucose molecule, you can get 18 times more energy using oxygen in the mitochondrion compared to anaerobic glycolysis. Normal tissues only use this less efficient pathway in the absence of oxygen — eg. muscles during sprinting. This creates lactic acid which causes the ‘muscle burn’. However, cancer is different. Even in the presence of oxygen (hence aerobic as opposed to anaerobic), it uses a less efficient method of energy generation (glycolysis, not phosphorylation). This is found in virtually all tumors, but why? Since oxygen is plentiful, it seems stupid, because it could get way more ATP using OxPhos. But it can’t be that stupid, because it happens in virtually every single cancer cell in history. This is such as striking finding that it has become one of the emerging ‘Hallmarks of Cancer’ as detailed previously. But why? When something seems stupid, but happens anyways, it’s usually us who are stupid for not understanding. So we need to try to understand it rather than dismissing it as a freak of nature. For single celled organisms like bacteria, there is evolutionary pressure to reproduce and grow as long as nutrients are available. Think of a yeast cell on a piece of bread. Grows like crazy. Yeast on a dry surface like a countertop stays dormant. There are two very important determinants of growth. You need not only the energy to grow, but also the raw building blocks. Think of a brink house. You need construction workers, but also bricks. Similarly, cells need the basic building blocks (nutrients) to grow. For multi celled organisms, there is generally plenty of nutrients floating around. The liver cell, for example, finds lots of nutrients all over the place. The liver does not grow because it only takes up these nutrients when stimulated by growth factors. In our house analogy, there are plenty of bricks, but the foreman has told the construction workers not to build. So nothing is built. One theory is that perhaps the cancer cell is using the Warburg Effect to not just generate energy, but also the substrate needed to grow. For a cancer cell to divide, it needs lots of cellular components, which requires building blocks like Acetyl-Co-A, which can be made into other tissues like amino acids and lipids. For example, palmitate, a major constituent of the cell wall requires 7 ATP of energy, but also 16 carbons that can come from 8 Acetyl-CoA. OxPhos provides lots of ATP, but not much Acetyl-CoA because it is all burned to energy. So, if you burn all the glucose to energy, there is no building blocks with which to build new cells. For the palmitate, 1 glucose molecule will provide 5 times the energy needed, but will need 7 glucose to generate the building blocks. So, for a proliferating cancer cell, generating pure energy is not great for growth. Instead, aerobic glycolysis, which produces both energy and substrate will maximize the rates of growth and proliferate the fastest. This may be important in an isolated environment, but cancer does not arise in a petri dish. Instead nutrients are rarely a limiting factor in the human body — there is plenty of glucose and amino acids everywhere. There’s lots of available energy and building blocks so there is no selective pressure to maximize ATP yield. Cancer cells perhaps use some glucose for energy and some for biomass to support expansion. In an isolated system, it may make sense to use some resources for bricks and some for construction workers. However, the body is not such a system. The burgeoning breast cancer cell, for example, with access to the blood stream, which has both glucose for energy and amino acids and fat for building cells. It also does not make any sense of the link with obesity, where there are plenty of building blocks around. In this situation, cancer should maximize glucose for energy, since it can easily obtain building blocks. Thus, it is debatable whether this explanation of the Warburg Effect plays any role in cancer’s origin. There is an interesting corollary, however. What if nutrient stores were significantly depleted? That is, if we are able to activate our nutrient sensors to signal ‘low energy’ then the cell would face selective pressure to maximize energy production (ATP) moving away from cancer’s preferred aerobic glycolysis. If we lower insulin and mTOR, while increasing AMPK. There is a simple dietary manipulation that does this — fasting. 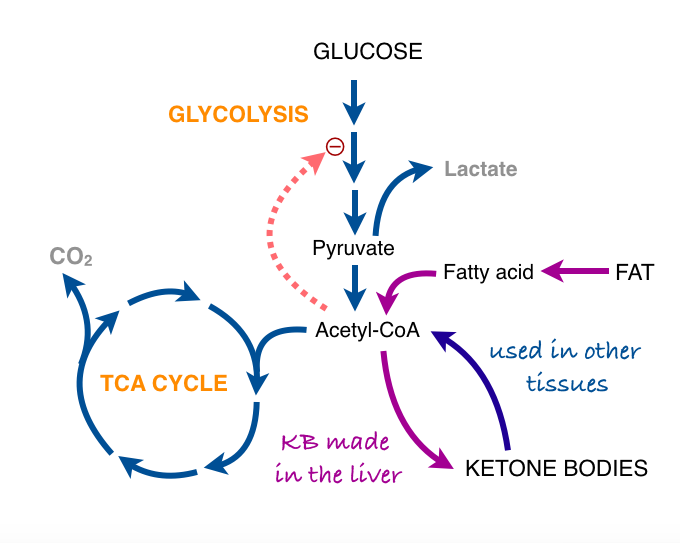 Ketogenic diets, while lowering insulin, will still activate the other nutrient sensors mTOR and AMPK. Another misconception of the Warburg Effect is that cancer cells can only use glucose. This is not true. There are two main molecules that can be catabolized by mammalian cell — glucose, but also the protein glutamine. 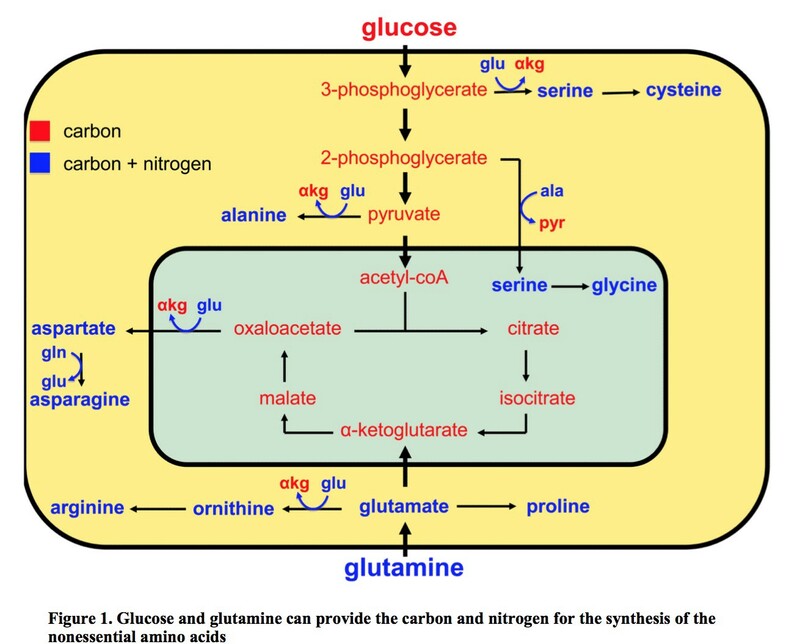 Glucose metabolism is deranged in cancer, but so is glutamine metabolism. Glutamine is the most common amino acid in the blood and many cancers seem to be ‘addicted’ to glutamine for survival and proliferation. The effect is most easily seen in the Positron Emission Tomography (PET) scan. PET scans are a form of imaging used heavily in oncology. A tracer is injected into the body. 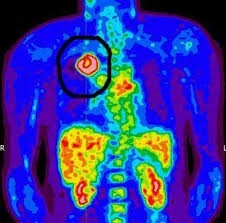 The classic PET scan used fluorine-18 fluorodeoxyglucose (FDG) which is a variant of regular glucose which is tagged with a radioactive tracer so it can be detected by the PET scanner. Most cells take up glucose at a relatively low basal rate. However, cancer cells drink up the glucose like a camel drinks up water after a desert trek. These tagged glucose cells accumulate in the cancerous tissue and can be seen as active sites of cancer growth. In this example of lung cancer, there is a large area in the lung that is drinking up the glucose like crazy. This demonstrates that cancer cells are far, far more glucose avid than regular tissues. However, there is another way to do the PET scan, and that is to use the radioactively tagged amino acid glutamine. What this demonstrates is that some cancer are just as avid for glutamine. Indeed, some cancers cannot survive without glutamine and seem ‘addicted’ to it. Where Warburg made his seminal observations about cancer cells and perverted glucose metabolism in the 1930s, it was not until 1955 that Harry Eagle noted that some cells in culture consumed glutamine by over 10 times that of other amino acids. Later studies in the 1970s showed that this was true for many cancer cell lines also. Further studies showed that the glutamine was being converted to lactate, which seems rather wasteful. Instead of burning it as energy, the glutamine was being changed to lactate, seemingly a waste product. This was the same ‘wasteful’ process seen in the glucose. Cancer was changing glucose to lactate and not getting the full energy bonanza from each molecule. Glucose provides the mitochondria with a source of acetyl-CoA and glutamine provides a pool of oxaloacetate (see diagram). This supplies the carbon needed to maintain citrate production in the first step of the TCA cycle. Certain cancers seem to have exquisite sensitivity to glutamine starvation. In vitro, pancreatic cancer, glioblastoma multiform, acute myelogenous leukaemia for example ofter die off in the absence of glutamine. The simplistic notion that a ketogenic diet may ‘starve’ the cancer of glucose does not hold up to the facts. Indeed, in certain cancers, glutamine is the more important component. What’s so special about glutamine? One of the important observations is that mTOR complex 1, mTORC1 a master regulator of protein production is responsive to glutamine levels. In the presence of sufficient amino acids, growth factor signalling occurs through the insulin-like growth factor (IGF)-PI3K-Akt pathway. This PI3K signalling pathway is critical for both growth control and glucose metabolism, underscoring once again the close relationship between growth and nutrient/ energy availability. Cells do not want to grow unless nutrients are available. We see this in the study of oncogenes, most of which control for enzymes called tyrosine kinases. One common feature of tyrosine kinase signaling associated with cell proliferation is regulation of glucose metabolism. This does not happen in normal cells that are not proliferating. The common MYC oncogene is particularly sensitive to glutamine withdrawal. Switch over from the more efficient energy generating OxPhos to a less efficient process, even though oxygen is freely available. Need glucose, but also need glutamine. But the million dollar question still remains. Why? It is too universal to be just a fluke. It’s also not simply a dietary disease, since many things, including viruses, ionizing radiation and chemical carcinogens (smoking, asbestos) cause cancer. If it is not simply a dietary disease, then a purely dietary solution does not exist. The hypothesis that makes the most sense to me is this. The cancer cell does not use the more efficient pathway, because it can’t. If the mitochondrion are damaged or senescent (old), then cells will naturally look for other pathways. This drives cells to adopt a phylogenetically ancient pathway of aerobic glycolysis in order to survive. Now, we come to the atavistic theories of cancer.